Home Articles Digital Marketing What Should We Know about Amazon PPC Campaigns? Sharline Shaw, the founder of a leelineSourcing.com, is an expert on Chinese export trade. With 10 years experiences in the field of sourcing in China, she is familiar with all relevant regulations and laws about China's exporting. She'd love to share her experience with people and has written many helpful articles. If you are an Amazon seller, you are likely to search “How to promote your products on Amazon?” The best answer is Amazon PPC ads. Amazon PPC ads are also known as Sponsored Products Ads. These ads rank top in the search result page as a recommendation of the search engine. Amazon PPC stands for Amazon paid-per-click. It is an advertising solution offered by the Amazon platform for sellers to buy a position at the top of the Amazon search result page. Advertisers have to pay every time a customer clicks on the ad. Hence it’s called Amazon Pay per Click. If you run a successful PPC ad campaign, your advertised products will reach millions of online shoppers; these are shoppers who are looking for an item and ready to buy it. Many successful sellers recommend this method of advertising as a primary promotion method because it will bring you an increase in sales, traffic, and profits. When you are running a PPC campaign, the system will monitor your sales performance. It’s up to you to decide on further promotion. If Amazon PPC campaigns are new to you, you are in the right place. This guide will not only explain what an Amazon PPC campaign is but also give you a constructive idea of how to put an effective campaign together. Known as the Amazon Sponsored Product, Amazon PPC is a great solution offered by Amazon to help sellers to boost their product sales online. Similar to Google AdWords, Pay-Per-Click (PPC) ad campaigns are an advertising method where advertisers have to pay only for the ad that a potential buyer clicks. The ad they click takes them to the product page for the item being advertised. You might also hear PPC called CPC and this stands for cost per click. Amazon PPC works like an auction system. To buy an ad, you need to bid on the search term that online shoppers might use. You’re bidding to win the top position on the Amazon search result page. Normally, the effectiveness of an ad campaign is determined by the ad campaign budget and the quality of the ad. How visible the ad is and how it ranks is dictated by the sellers’ campaign budget and the quality of the ad. 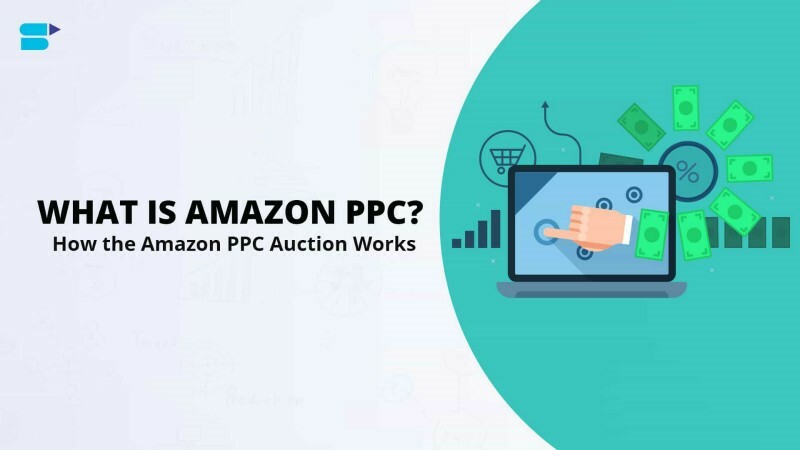 The result of your Amazon PPC ad is based on the keywords you bid for in the auction. Generally, sellers will bid on several keywords; these keywords are the ones they expect shoppers to use when they search for a product they would like to buy. The highest bidder for the keyword will be the first product on the Amazon search result list, and the second-highest bid will rank the second, and so on. Similar to Google AdWords, sellers will only pay for the ad when possible online shoppers click it. Amazon uses a powerful algorithm to decide how advertisements appear for the search term that the customer enters. Keyword relevance is very important for the ranking of your ad. The price, product relevance, and the ad campaign quality are the key factors that the algorithm considers as it chooses search results. Ad campaign quality scores are mainly affected by the overall performance of the ad including the ad click-through rate, total number of clicks, campaign page, etc. There are three Amazon PPC ad types, these are Sponsored Product ads, Product display ads, and Headline search ads. Advertisers can choose which best suits them when they set up the ad campaign. Sponsored Product Ads are the most popular type of Amazon ad. These ads will appear at almost every stage of the search engine function. Sponsored product ads appear on the search result page, on the right of the organic listings, below the headline search ads, and on the product detail page. Sponsored product ad campaigns have two types; either auto campaigns and manual campaigns. Headline search ads are shown above the sponsored product listings, and these are quite useful if you are targeting top-of-the-funnel shoppers. These ads attract their attention before they know what they want. The third type of ad is the Product Display Ads which appear on the product detail page. This type of ad is useful when appearing against a competitor product as you can try to sway customers to buy yours instead. A further use for them is when selling related or supplementary products to the one they are browsing. The two types of PPC campaigns that you could run are auto and manual campaigns; generally, this only applies to Sponsored Product Ads. An auto campaign means that your ads are bid for automatically by the auction system and you don’t even need to set up a keyword list as the Amazon algorithm determines what would be best for your product. All you need to do is set a budget and a duration for your campaign. For a manual campaign, you will not only have to set your budget, duration, and other factors, but also the keywords. Keywords are the most important part of your ad; list all possible terms that the shopper may use to find your product. Based on your keywords’ relevance, cost, and ad quality, the Amazon algorithm will determine the placement of your ad on the search result page. What Is Required to Run Amazon PPC Ads Campaign? Amazon has requirements for sellers who want to advertise their products on the platform. If you are planning to run an Amazon Ad, you have to check you are keeping to the rules so that your campaign will go ahead successfully. Following the marketplace rules help you run a great business and makes sure you can leverage the platform to reach your sales and profit goals. Firstly, your seller account should be active; banned Amazon seller accounts will not work on the platform. All advertisers should be able to ship products to the US. Additionally, if you want to advertise Sponsored Products, you have to win the Amazon Buy Box eligibility. To be eligible, your account must be a professional account and the major metrics related to your business performance need to be good and showing sufficient orders. 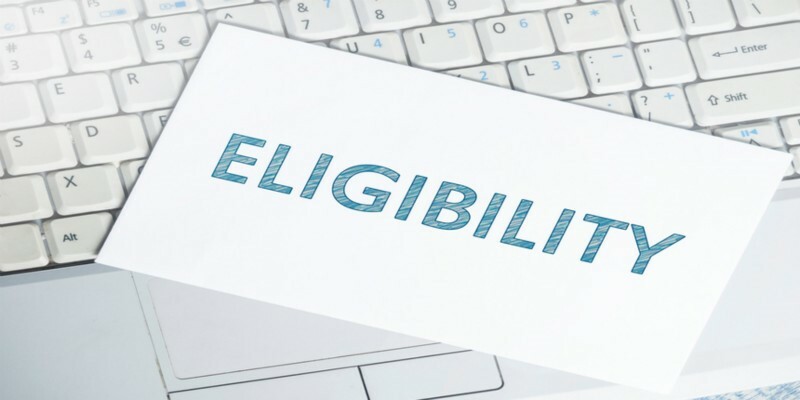 What’s more, if you want to run Headline Search Ads, you have to enroll for qualification in the Amazon Brand Registry. When you decide to bid for an Amazon PPC ad, you need to pay special attention to your bidding strategy. As we know, the placement of your ad is based on a combination of factors such as keyword relevance, budget, and ad quality. For instance, if you want to bid on relevance, you need to find profitable keywords with high conversion rates. Create a list of highly relevant keywords that easily match with shoppers’ search term. Normally, you choose your keywords based on possible terms that tend to get more clicks. As such, the keyword quality of your ad campaign matters more than the number of keywords. Advertisers will also consider how much to bid for their campaigns; their budget determines this. The best practice here is to bid high on new keywords for your products. The Amazon algorithm prefers high bids, and the new keyword doesn’t have any traffic history. Thus, it is likely to get popular and increase your sales. To attract possible customers and gain more sales and profit margin, advertisers have to keep finding new keywords for their ad campaigns. A manual campaign offers you the opportunity to test it and check if it will bring you sales. For beginners, it will be hard for you to decide which campaign to start with. The best strategy is to start both an auto and manual campaign for the same product at the same time. You can let the search engine determine the best keyword for your product, and you can monitor and analyze them. Compare the results of both types of campaign, and then you can revise your marketing strategy to promote your business. How to Set Up an Amazon PPC Ad Campaign? First, log into the Seller Central account and find the Campaign Manager on the dropdown menu of Advertising. In the Campaign Manager page, set your campaign budget and duration. You need to give your campaign a name and then create different ad groups corresponding to different keywords. Remember to keep it well-structured. When it comes to the budget, you have to determine your monthly budget, and then decide your daily budget. For the duration setup, you have to make sure you will get sufficient data for your business within the period. Then choose which type of campaign, auto or manual campaign. Next, you will have to name the group of ads, and choose the products to be advertised. If you choose the manual campaign, you have to list your bidding keywords. There are suggested keywords and also the option to provide your own keywords. You can choose the right one for your business. If you already have your own keywords, click “Provide your own keywords” and then choose the match type and bid. Click “Save and Finish” and the setup process is complete. 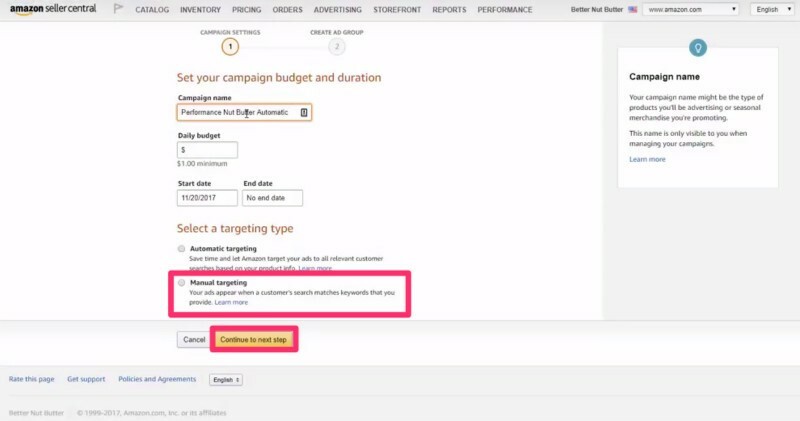 How to Measure Amazon PPC campaigns? When you analyze your PPC ad campaign and look at the result you will want to know if it was a success or a failure. There are some key metrics to help you determine the effectiveness of the ad campaign. Make sure to track these key metrics. When you are running Amazon PPC ad campaigns, the click-through rate is the basic data you have to monitor. Divide the total number of clicks the ad gets by the total number of impressions, and you will get the CTR. The higher the CTR, the more effective your ad is. The cost per click is the average cost you have to pay for a single click. To get a better return on investment, sellers need to figure out how to reduce their CPC. The Conversion rate is another key factor to determine the success of your ad campaign. It is calculated by dividing the number of conversions by the number of clicks an ad received. For instance, you get 100 clicks, and only 5 people purchase your product then your conversion rate is 5%. You should look at this on a one, 7, and 30-day basis. This metric measures all your advertising costs and divides them by the sales of the campaign. This makes it easy for you to see how much you have to pay for advertising per dollar of sales. For example, if you spent $10 on your ads and you get $100 worth of sales, it means your ACoS is 10%. There is no fixed figure to guarantee the success of your Amazon sponsored campaign. To generate more profits, the ACoS should be as lower as possible; most sellers try to keep this cost down. How to Optimize Amazon PPC Ad Campaigns? Ultimately it is your product listing that influences your shoppers’ buying decision, and this means that you have to optimize the product listing page. Make your page enticing and compelling for customers. Remember to utilize high-quality product images, attractive titles, and call-to-action features etc. Use your ad keywords on your product page to gain more attention for your page. Optimizing your keyword list is your priority. Review the keyword performance from the report. Keep an eye on the keywords with the highest spend. Look for new keywords and identify relevant search queries for your products. Expand your keyword list with long-tail keywords and phrases. For the keywords that generate few clicks; remove them from the list. In addition, use the negative keywords for greater targeting accuracy. Check the consistency of your ad campaign, and get to know if it is consistent with the product category, your brand, and the top sellers. To avoid repeating ads, group your products well and create a well-structured campaign. Put similar products or keywords in the same ad group to avoid possible confusion. You can easily get some new keywords through the Amazon PPC campaigns. You can test the new keywords to monitor their performance and then optimize your keyword list accordingly. Hopefully, you now understand Amazon PPC campaigns, and you can start your own PPC ad campaign to promote your business and boost your sales. Give it a go for your business and products.